Be prepared for a brand new episode of artificial intelligence at the legendary session that swept America off its feet. 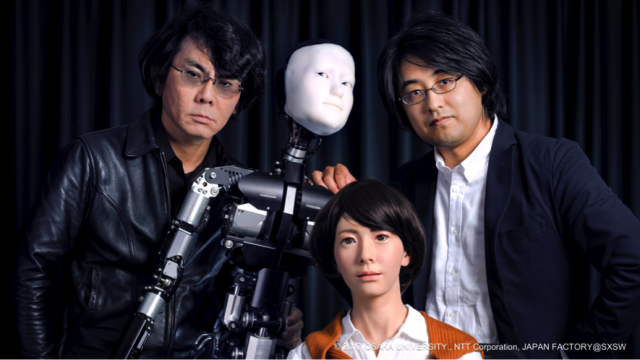 Don’t miss out on the sequel that takes a quantum leap from last year’s featured session “Androids and Future Life” led by Dr. Ishiguro from Osaka University, as he returns with Dr. Higashinaka of NTT, involved with “Discussion Dialogue Technology” and two new humanoid robots. In the rapid realm of advancing technology, artificial intelligence has arrived at a point where robots can now understand the context in which human society places itself. The complementary relationship between the words virtual and reality have transcended to the most minor of differences. We are now approaching a time where artificial intelligence in robots are making significant advances in deciphering implicit meanings in our everyday conversations, making it possible for robots to participate in casual dialog. For those who want to experience a taste of this residual indulgence, you are welcome to come on over to meet Skeleton and U-chan as they take it easy post show at Japan Factory from March 12 – March 14! Trinity Warehouse, 99 Trinity St.